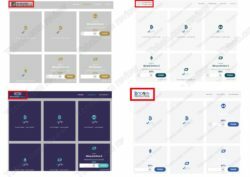 In this review we prove that the Bitcoin Revolution program is a scam that is here to lose your money. Bitcoin Revolution is supposed to be a program that simplifies Bitcoin trading, so that ordinary people can profit. It allegedly can earn you up to $1,000 per day. And because Bitcoin Revolution is free, the question is, can it make you money for free? The truth is that Bitcoin Revolution is just a scam that won’t earn you any money. In reality it will force you to lose your own money. 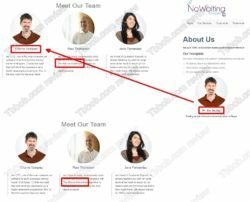 On the Bitcoin Revolution website you will find a team of people who allegedly are behind this program. But they are not. These photos have been stolen across the Internet, they belong to somebody else. 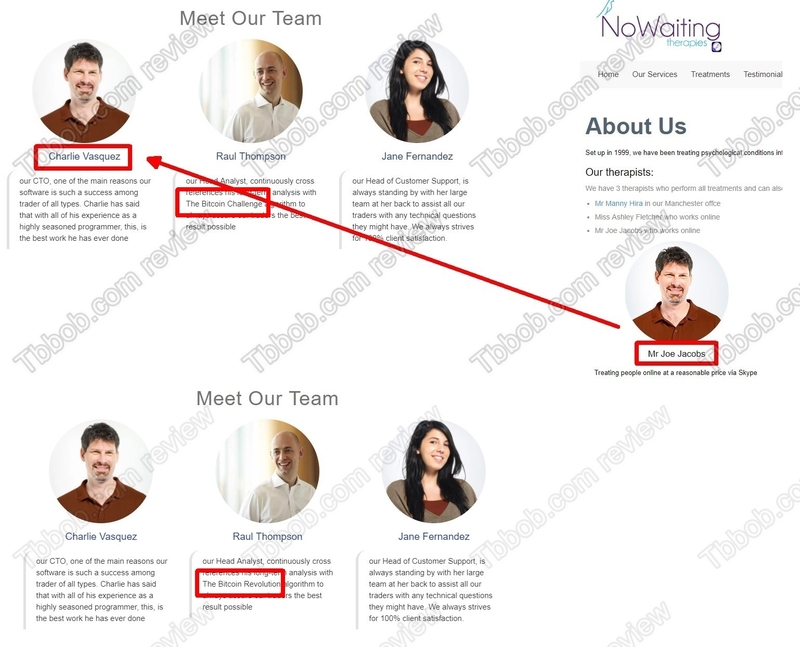 In fact, this same fake team has been presented by the Bitcoin Challenge scam that we have already reviewed. 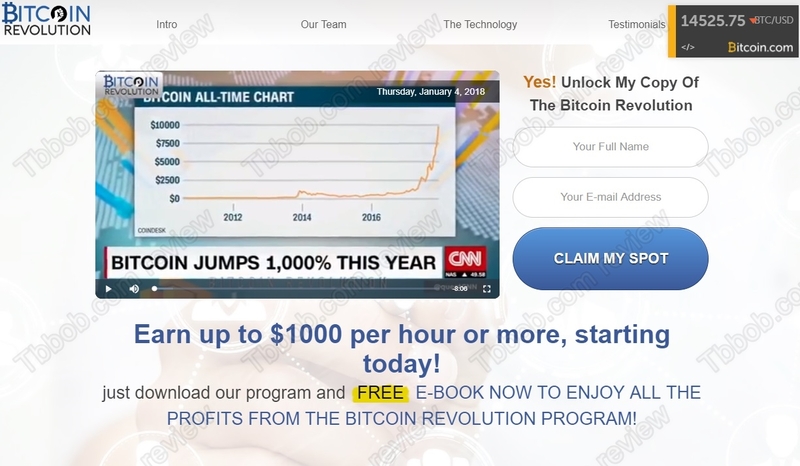 Bitcoin Revolution is a clone of this scam. Scammers used stolen photos also when fabricating testimonials. All positive reviews that you can find about Bitcoin Revolution are fake. People you see on those photos have no idea that their identities are abused by this scam. And last but not least, we tested the Bitcoin Revolution robot software that is supposed to make you money on autopilot. What we found is known scam software that loses money. 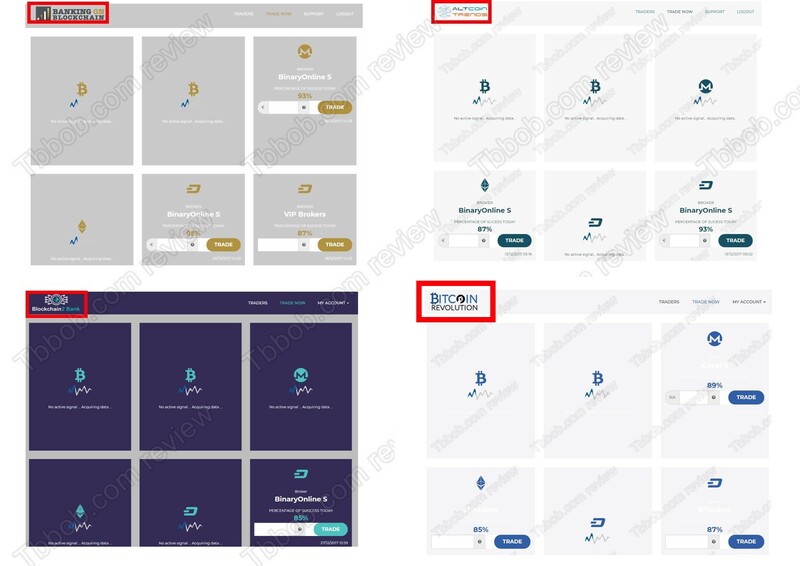 Take a look at our picture and you will see that the same app is used by other scams, like Banking on Blockchain, Blockchain 2 Bank or Altcoin Trends. We get a lot of feedback from real users about this software, and they all tell us that it is losing money in real trading! If you still don’t see how Bitcoin Revolution will lose your money, here is the explanation. When you sign up for the program, the first thing you will have to do is to deposit money with one of the selected brokers, which by the way are not regulated, like KayaFX or Btraders. You will have no choice and you will be told that until you deposit, the trading software won’t be active. If you deposit, scammers who run Bitcoin Revolution will get paid by the broker for referring a new depositor and then the trading software will lose your deposit in trading. End. Bitcoin Revolution is a cloned scam, it is designed to lose your money, so stay away from it! If you are interested in making money in cryptocurrency trading, try first a free demo account with a regulated broker. Only if you manage to build a profitable strategy on the demo, you can start thinking about trading with real money. But don’t forget that trading is risky anyway. I thought I would have ago at this went with the same company right scammers as you say. You lose monies hand over fist, and all the, people want is you to add more. It says they will take 2% but they take 10% and you can do nothing about it. You can not withdraw your monies with out a struggle. The Dragons have since said it is a scam that they fell for, and instead of helping people make a little monies they lose a bloody lot. I think the Dragons should stand up and say a lot more about this SCAM, COME ON PETER TELL PEOPLE WHAT IT IS REALLY. I to have just signed up with Click2Sell and handed over $349 AUD ($250 US). then I found this site. I have requested a refund now – within 5 minutes of giving them my money. I will just have to wait and see if I get it back. I wish I had found this site before signing up. Do you know if they continue to draw on you account and clean you out? Very worried now! If you do internet banking just sign in to your account with the bank and reduce the card account’s daily limit to $10 . Then contact the bank and arrange to block any further withdrawals. Thanks for the review about Bitcoin Revolution it obviously sound like a BIG SCAM and not to be used, just to be avoided at all cost, I also know another trading company that is also a scam and fraud the are called LTX Markets.com they are also fraudsters and thieves, they contacted me and persuaded me to deposit £250 in to a trading account with them, then after a month or 2 they kept saying that if you deposit more you will make more money and we can make more money for you. they took £2500 from my account which I was never able to withdraw from the trading account as the withdraw process was fake and didint work. they cleared out the trading account and stroll the money and now even there website is off line. they are nothing but LIARS, AND SCAMMERS. LTX Markets.com was not regulated.They are nothing but scammers. to be avoided at all costs. i have invested £300 pounds with bit coin Alan Brown i havent traded with him yet. i phoned my bank froud squad i was told that becouse i havent traded with him i will be able to get my money back through the bank but i have to wait 15 days to claim. Be careful. I saw a fake news that said Elon Musk is going to left Tesla to invert in this revolution. By curiosity I look in their page, and another sign of alarm… “due to the high level of people asking for taking part you have limited time to join”. A little investigation on internet trusty fonts reveals that this “movement” is from months ago and Mr. Musk has not intention to left Tesla, hahaha. It’s a pity that authorities whom control internet doesn’t close this kind of webpages quickly. I read the news about this bitcoin revolution on internet. I don’t realise it’s fake news, so I key-in my contact number. Today somebody contact me via phone and saying he will need to complete the registration so my bitcoin revolution will be activated. He dare to mention my country law to convince me. I told him I will consider to deposit next time, he started being rude and talk loudly. I hang up the phone. Conclusion: Bitcoin revolution is obviously SCAM. the-bitcoin-revolution.org/EN/BR/?aid=show — another one of those scammy websites. XtraderFx is a con, a scam, dont give them your money or it will be the last you see of it, how they are allowed to steal your money without being prosecuted l dont know, ITS A SCAM ITTS A SCAM so now you dont have to loose like so many others.